NEW YORK (CNNMoney.com) -- The Federal Reserve rolled out a proposed rule Thursday that caps the fees banks can charge retailers when customers swipe their debit cards. The rules would likely hurt credit card network companies Visa and MasterCard the most. 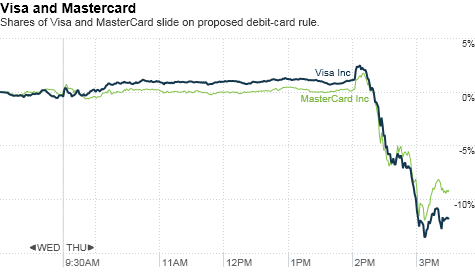 Shares of Visa closed nearly 13% lower following the news, while shares of MasterCard (MA, Fortune 500) slipped more than 10%. Under the proposal, merchants would be charged no more than 12 cents per debit-card transaction, the Federal Reserve Board said at a meeting Thursday. Mandated by the Dodd-Frank Wall Street reform act and part of a measure introduced by Senator Richard Durbin (D-Ill.), the fee cap aims to make "swipe" fees -- also known as interchange fees -- "reasonable and proportional" to what it actually costs banks and issuers to authorize, clear and settle transactions. The rule is open for public comment until Feb. 22. After the comment period ends, the Fed will consider recommendations and make revisions if necessary. Along with the main issuers MasterCard and Visa, profits for big banks are also likely to suffer under the new rule. With average interchange fees currently running from $1 to $1.30, the 12-cent cap will cut these charges by up to 90%, JPMorgan analyst Tien-tsin Huang wrote in a note to clients. Moshe Katri, an analyst at Cowen and Co., said Wall Street had been expecting a 50% cut. Bank of America (BAC, Fortune 500), one of the nation's largest issuers of credit cards, estimated in July that a cap on interchange fees could drain $1.8 billion to $2.3 billion from its annual debit card revenue. "The rules proposed by the Federal Reserve today will have a dramatic impact on the cost of banking services for consumers nationwide," the American Bankers Association said in a statement. "They essentially relieve retailers of paying their fair share for a card payments system that offers them tremendous benefits." In its meeting, the Fed acknowledged that the rule could impact debit card use, by leading issuers to eliminate rewards programs for debit cards or encourage consumers to use other forms of payment. But the Merchants Payments Coalition said the cap is much needed, given that swipe fees have tripled since 2001, costing retailers more than $48 billion last year alone. "For years, big banks and credit card networks have used hidden fees and fine print to keep consumers and merchants in the dark, setting rules and raising fees with impunity," the coalition said in a statement. "Reining in these out-of-control fees will bring savings to small business and consumers struggling to make ends meet." It would be a win for consumers because the lower costs for retailers could result in savings for customers. "The proposed regulations will benefit consumers by lowering the billions of dollars annually in non-negotiable swipe fees paid by merchants to large banks and the dominant credit card networks," Ed Mierzwinski of the U.S. Federation of Public Interest Research Groups said in a statement. "Lower swipe fees mean lower prices at the checkout counter."